I apologize for not being able to blog but I’ve had so much going on! I really do miss blogging and I have told myself to commit to it at least 2-3 times per week. I have many ideas coming up and I hope to share them very soon! 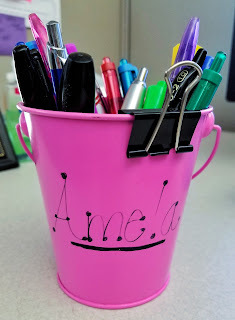 I wanted to share what my office essentials were. 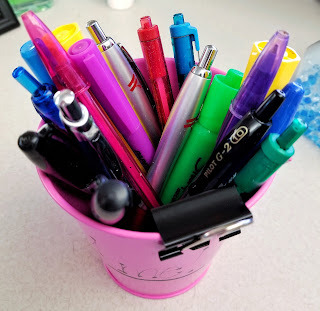 I know many people work in office settings or, if you’re like me, and you didn’t until recently and you were super excited and wanted to buy everything at once! I have been working at my current office job since February of 2015 and I have bought everything from decorations for different seasons to binders and notebooks and so much stuff. I have cut down quite a lot but I thought I would share what the basics I find to be necessary. Hand sanitizer and disinfecting wipes. These are probably two of the most important things you will need in the office. I can’t tell you how many times I’ve had to move desks and the person before me was a total slob. I am neat freak and when I see crumbs, dust, and junk all over your place of work, it grosses me out. 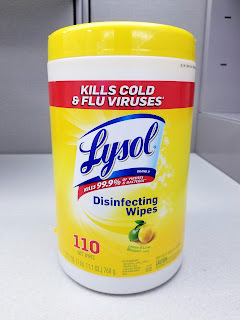 I have used the disinfecting wipes several times when moving desks, as well as my own desk. Sometimes I get food on my desk (I use a plate, don’t worry, things happen and spill) and I use the wipes to clean it up. I will sometimes just have a dusty desk from the vents above and the wipes come in really handy to clean it up. 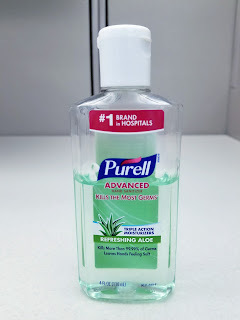 I use my hand sanitizer every day before eating my lunch and snacks, even after washing my hands. If I could only have 2 things on my desk, it would be those two. Sticky notes. You can never go wrong with sticky notes. I think the first thing we all think to buy is sticky notes, to be honest. When I first started, I swear that I used 2 to 3 packs and stick it wherever I had room.. to my monitor, to my desk, to my shelves and cabinets. As I started to get more familiar with my job, I started tossing them. I now probably have about 4 sticky notes and that’s just for new information that I know I will forget. 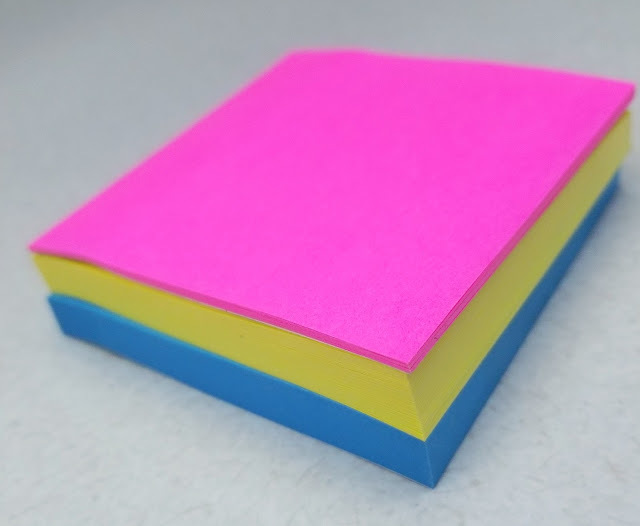 I found that using my sticky notes and writing stuff now, with being able to refer to it later, really helped me gain knowledge and confidence in my job. 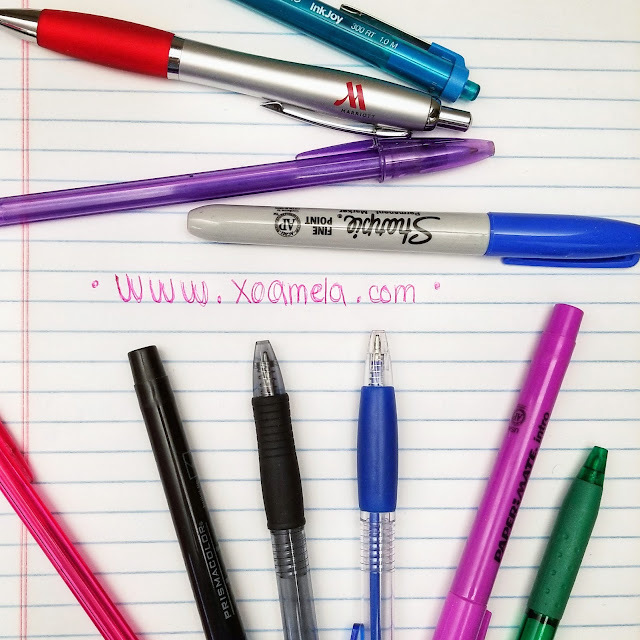 Pens/Pencils/Highlighters. Although I use a lot of things on my computer and information is all stored on there, I sometimes need to write down information so I can refer to it later. The pens really help in those situations. I don’t really need all of them but sometimes on my calendar, I like to write things out in different colors so that’s why I keep them all there. You won’t need as many as I have but I love having a variety to chose from. Water. I was going to write water bottle, however, mine is more of water cup..holder..thing. (Edit: It's called a Tumblr!) I love mine because I get to drink from a straw. I can sometimes be clumsy and tip over things so if this were to ever tip over, it would take a long time for all of the water to spill out. I got this guy from Walmart and it was around $5. I loved it so much that I bought a second one for myself to have at home in a pink color. 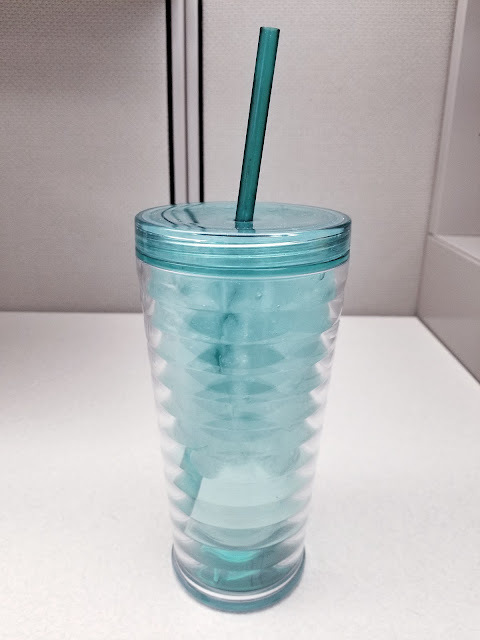 You can get any container that you want but having water is really important because if you’re not getting at least half your body weight, in ounces, you’re considered dehydrated. For example, if you weigh 120, you would need to drink at least 60 oz of water per day, minimum. Tissues. I keep tissues literally glued to me. Ok, not literally, but my nose is always having issues whether it’s runny or stuffy, I have to have tissues with me. Sometimes, I use the tissues for non-nose related things like wiping off food I spill or if my makeup is runny, I can use the tissue to touch it up. This is not one I personally bought, but rather it was given to me by the company I work for. 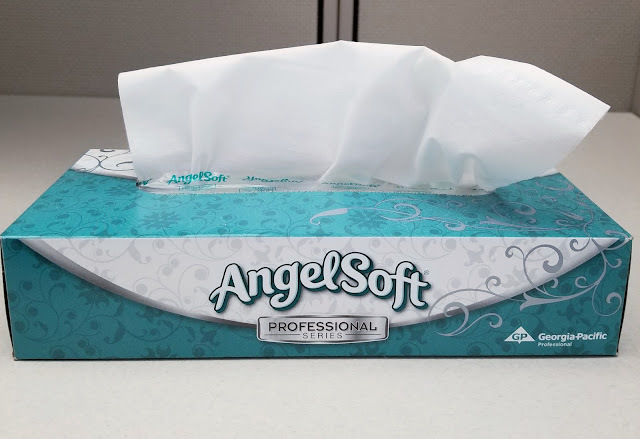 These are actually quite rough, not soft as it says, so I recommend getting soothing tissues for when you need it. A Mirror. I just love looking at myself. Just kidding!! 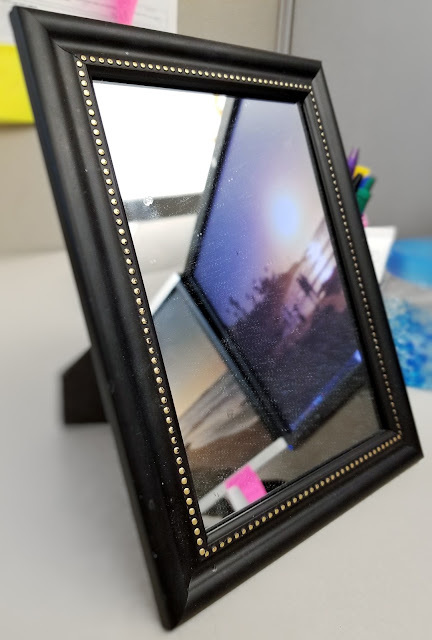 I love having a mirror at my desk because sometimes I have food in my teeth, or lipstick, or my makeup is smudging, or whatever the case may be, I need a mirror to be able to take care of that stuff right away. I let someone borrow mine for a couple hours and my desk looked naked. I think having a mirror is a great thing to keep because it can be very useful to have at your desk instead of getting up and going to the bathroom. The mirror I have was gifted to me but you can find them anywhere. Charging port. I can’t tell you how many times I’ve gotten bored at played on my phone or looked at memes throughout the day. (sorry!) With all that fun, my phone’s battery has completely drained. I remember on my old phone, I had to dim the brightness to the lowest setting so I could use my phone by the time I left for the day. 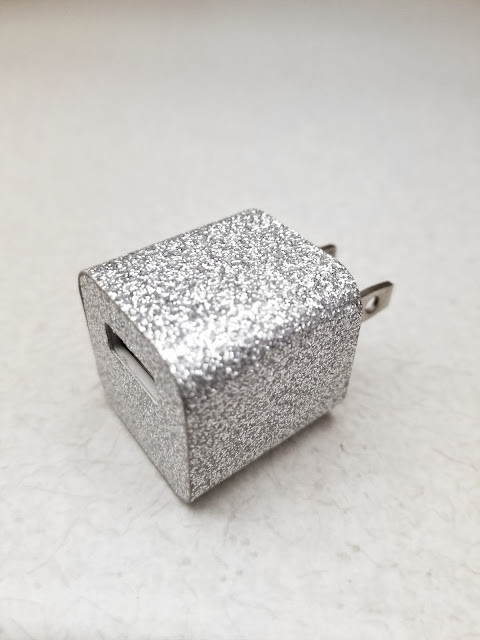 I quickly learned how important it is to have your phone charger and a charging port at work. Now, I can leave my phone charging and look at memes and still go home with 100% battery life. That is called being a winner. Lol!! Folder holder. I didn’t know what to call this one but this thing literally holds my folders. I guess you can call it a magazine holder but I use it to keep all my important documents and fun coloring sheets. I bought the neon colored folders at Walmart, I believe, and the folder holder was from Gordmans. Both I got when they were on sale so it was really cheap, I would say less than $10 for both. 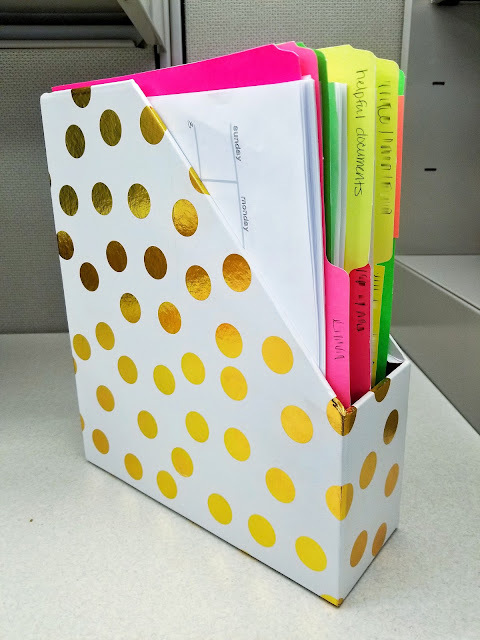 I use to have a really big 3-ring binder with all my important documents but as I progressed within my job, I learned that all of that paperwork was not needed so I shredded/recycled it and made them into small folders. Now, I have folders for new trainings I get and anything I know that I am going to forget. I also wanted to mention that I use lotion because my hands get really dry in this Colorado weather. It’s not really a necessity but it’s nice to have when your hands are dry. I also have air freshener crystal beads that I keep by my desk. I like it because the fragrance is not overpowering but smells just nice enough that I smell fresh linen at my desk! The last thing I wanted to mention is push pins. I know that not everybody has a desk that you can hang stuff up with push pins, but they are great to have when you need important documents hung up. 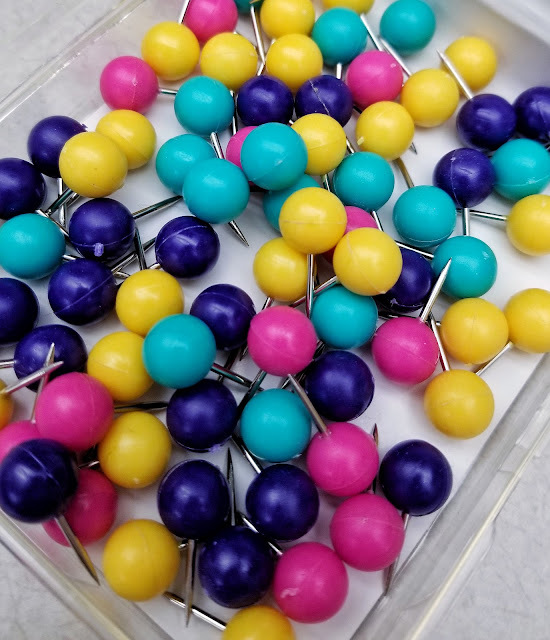 I got my push pins from Target.